The Alps Electric Europe SPGA Series Energy Harvester, available now from TTI Europe, is a compact power-generating device employing electromagnetic induction to generate power with each push or release. Low-power wireless technology is also combined so the device can function as a switch. 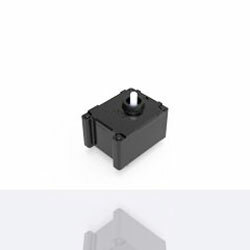 It can be installed away from the main board in places where connection to a power source or battery replacement, is difficult and is perfect especially for frequently operated equipment. The device offers a long operating life of one million cycles. Excellent feel is achieved with an operating force of 6±1.5N. The device has compact dimensions of only 17.5mm x 23mm x 17.9mm. The device provides sufficient power generation of more than 170μJW with each action (press or return).